Putting together jigsaw puzzles is fun for people of all ages, but creating your own puzzle offers a new twist on this classic pastime. 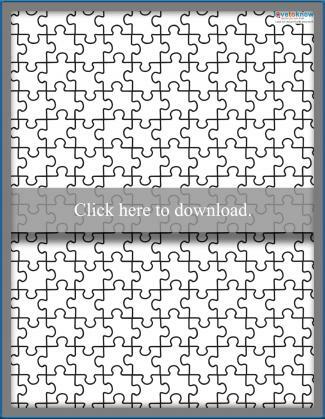 Download the following templates to create your own unique puzzles at home. 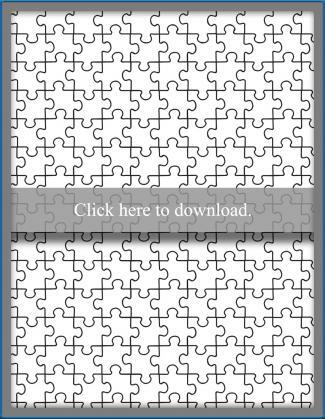 These free printable puzzle templates can be used by clicking on the link or image that you want to download, then saving the file to the appropriate location on your computer. The PDF templates should be used when you want to decorate a sheet of paper with crayons, markers, or colored pencils before cutting out the individual puzzle pieces. This sheet can also be used to print puzzle piece outlines over top of a sheet of purchased patterned paper, such as the papers used for scrapbooking. PDF files are opened using Adobe Reader. Visit the Guide for Adobe Printables for usage help and tips. The PNG file is a transparent overlay. 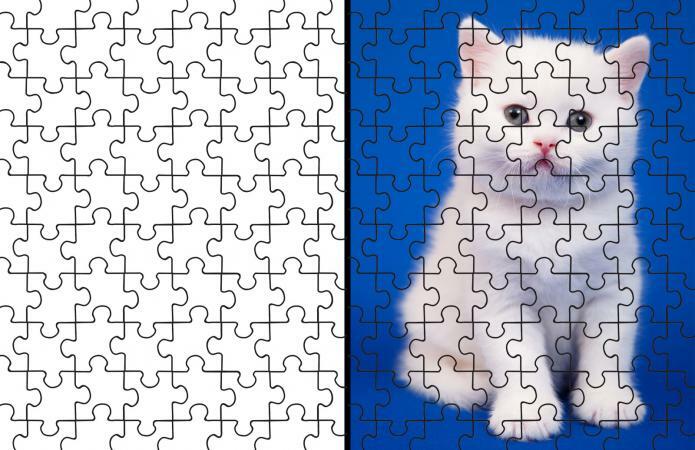 This file can be used in your favorite image editing software to add puzzle piece outlines over the top of a digital photograph or computer generated illustration, as seen in the photo of the kitten above. Photoshop is the best-known image editing software and can be used for this purpose, but a free program such as GIMP should be sufficient for creating your puzzle. 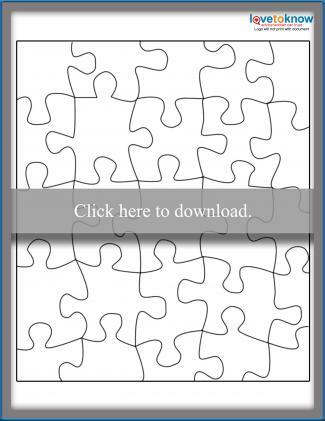 Both PDF and PNG versions are available as puzzles with large pieces or small pieces. Looking for something a little less challenging? This puzzle piece template only has 25 pieces, making it perfect for small hands. For best results, use a sturdy cardstock to print your puzzle. Plain printer paper is too flimsy to hold up to the manipulation that assembling a puzzle requires. 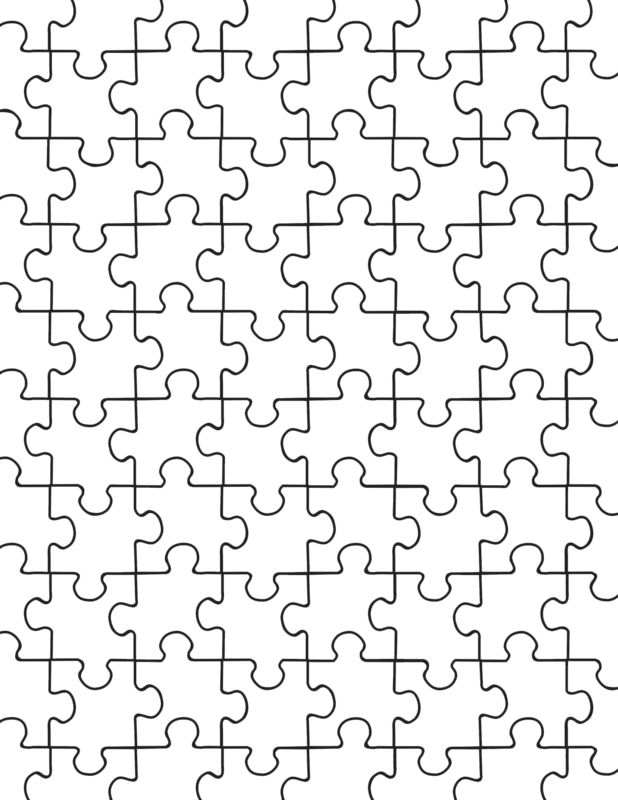 If you intend for your puzzle to be used multiple times, consider having the sheet laminated at a copy shop or office supply store before you cut out the individual pieces. This will make the puzzle more durable. Take your time cutting out your puzzle. Use fine tip scissors to make precise cuts that will allow for accurate puzzle assembly. Puzzle templates can be used in many different ways. Consider these six ideas to help you get started. 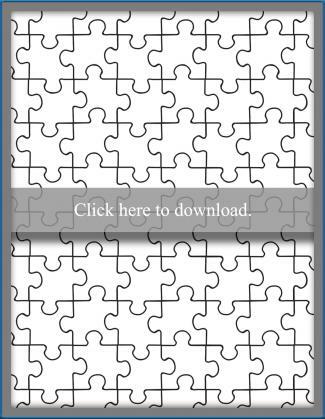 Print out the PDF puzzle template. Have your child draw a picture and write a message. Cut out the pieces, then add them to an envelope with a note that explains the recipient will need to assemble the puzzle to receive his or her card. Make a scavenger hunt more fun by requiring participants to assemble puzzles to reveal each clue. This craft could be done with either the PDF or PNG template. If you're having a surprise party, keep event details under wraps by sending out invites that require a bit of assembly. This craft could be done with either the PDF or PNG template. Make party favors by turning a picture that relates to the theme of your party into a puzzle, then packing the pieces in a folded origami box. For example, you could overlay the PNG puzzle template on a picture of Lego minifigures to make a party favor for a child's Lego-themed birthday celebration. If you're tired of boring scrapbook pages, turn a favorite photo into a puzzle using the PNG template. Assemble the majority of the puzzle in three large chunks, then glue the chunks to your layout with a small gap in between each one. Trail the remaining pieces from the lower right hand corner across the bottom of your layout. Use the PDF template to make puzzle pieces from patterned paper. Glue the cut out pieces around a favorite photo to create a pretty frame. 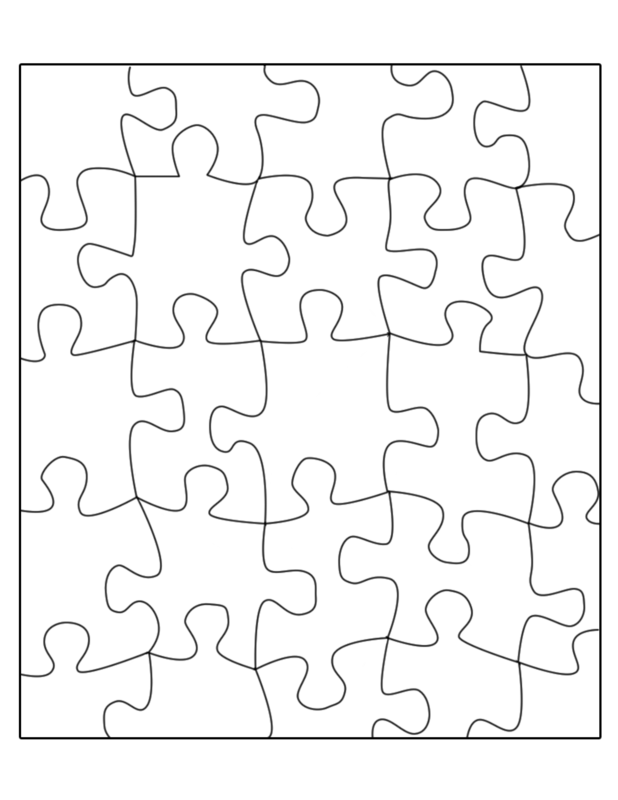 If desired, this technique could also be used to create a decorated box for the pieces of a traditional puzzle. 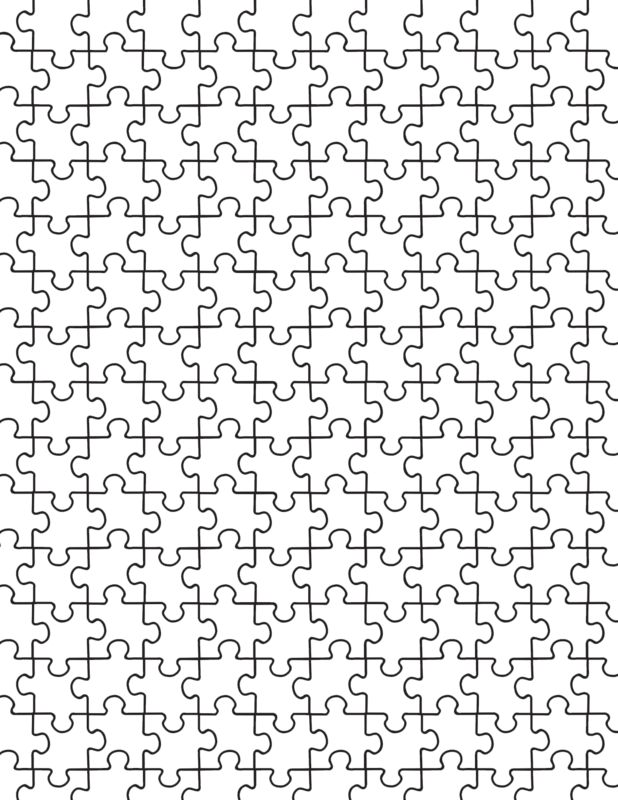 The best part about printable puzzle piece templates is that they allow you to create a one-of-a-kind puzzle that you won't find anywhere else. For the true puzzle lover, this is the perfect way to add to a puzzle collection without spending a lot of money.